What an amazing year it has been! The West Midlands has carved out a very busy 12 months and, in doing so, is creating a region which is fit for business. There continues to be transformational change which is powering the region to greater success; and many talented people with the vision to deliver this change. The adage “build and they will come” certainly rings true, and the will of those who have the power to make change is very noticeable to those of us who have lived and worked in the region for many years. One of the foundations for this positive change is the private and public sectors working together with the common aim of improving the economic prosperity of the region. The strategies are reaping benefits in the form of investment, jobs, better infrastructure and making the West Midlands a great place to live and work. It’s hard to list all the successes of the year because there are so many… but we’ve chosen our top 20 (in no particular order). We’d love to know what would be in your top 20… get in touch @MktgRecruitment. Andy Street becomes the first elected Mayor for the West Midlands. Birmingham is chosen as the host city for the 2022 Commonwealth Games and Coventry wins UK City of Culture 2021 – a great marketing opportunity for these two great cities #Birmingham #ThisisCoventry. Peddimore to offer industrial space on the A38 corridor near Sutton Coldfield which is expected to attract 10,000 jobs and contribute £350m to the local economy. 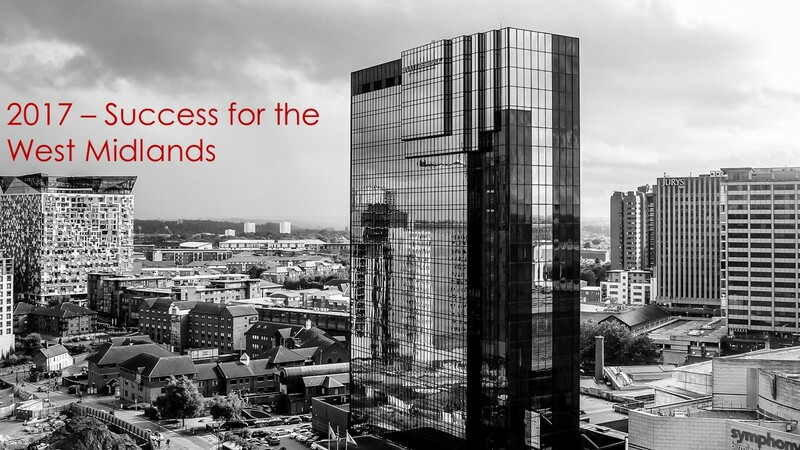 HSBC chooses Birmingham as the location for its new head office and PwC announces it is to move to new city centre premises to accommodate over 2000 employees highlighting the importance of the region’s banking and professional services sector. Wolverhampton Interchange gets £50m investment boost. A £280m business case agreed for major transport hub and economic gateway at Birmingham International creating 2,500 jobs. Warwickshire luxury car maker Aston Martin announces £500m package of investment and trade with Japan. Digital tech industries add £2bn to the region’s economy creating 14,000 jobs according to a report by Birmingham City University. Birmingham Airport recorded its busiest month ever on record for passenger numbers. Greater Birmingham and Solihull LEP announces it has created over 23,000 private sector jobs and is named top core city LEP for economic growth. £55m investment in Wolverhampton’s Westside leisure development announced with the prospect of 1,000 jobs to be created. £7bn of Midlands Engine opportunities for international investors announced at the annual global real estate event MIPIM. £680m investment to manufacture 107 trains for the West Midlands Rail franchise. A second devolution deal is announced for the West Midlands transferring powers to the region. HMRC announces its move to Arena Central in Birmingham for 3,600 employees. The region’s top-class universities continue to deliver value for the West Midlands. For example, Coventry wins £80m funding to be national centre for battery development (for pioneering electric vehicle technology) which aims to create up to 10,000 jobs thanks to great work by University of Warwick, Coventry City Council and Coventry & Warwickshire LEP. Paul Thandi – CEO of the NEC Group – is named Entrepreneur of the Year at the Birmingham Post Business Awards. The venue and entertainment business plays a vital role in the region’s regeneration, delivering over £2bn of economic impact to the area and supporting the equivalent of 29,000 full time jobs, and is a great example of how success breeds success. Jaguar Land Rover continues to motor on in 2017 with announcements it is to create 5000 new jobs, invest £7m in classic car production, and chose the streets of Coventry to launch tests for its driverless cars. And please indulge us for a moment in the last two…. Birmingham City FC didn’t get relegated in the summer (our MD has been a fan since he could walk) but judging by their position now that could be a different story next year! Finally, we have enjoyed our first full year of trading! It’s been a fast and hugely fun 12 months which is ending on a real high. We have had a very strong performing year and look forward to the beginning of 2018 for an even busier one! If you would like to discuss your marketing recruitment requirements for 2018 please get in touch with us on 01675 624500, email info@tmrgroup.co.uk or follow us on Twitter @MktgRecruitment. We are a friendly bunch so feel free to get in touch and we can show you how we “do recruitment” differently!